(SPOT.ph) Former Ms. Philippines Earth finalist Gretchen Casimiro has filed a complaint to the barangay against an unnamed woman who posted a morbid photo of her in Facebook, reports ABS-CBN News. The picture, which featured words like "In Loving Memory" and "R.I.P. 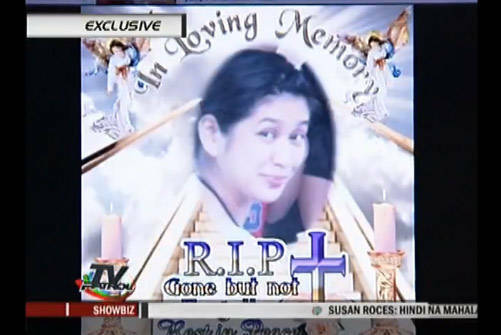 Gone But Not Forgotten" around Casimiro's photo, caused friends of the former beauty queen to send a barrage of sympathetic and condoling messages on Facebook. Casimiro is accusing a former friend she had a falling out with to be responsible for the picture. According to the Philippine National Police Criminal Investigation and Detection Group, the accused could be charged with libel and unjust vexation if proven guilty. Click the photo to watch ABS-CBN’s exclusive report on Gretchen Casimiro.